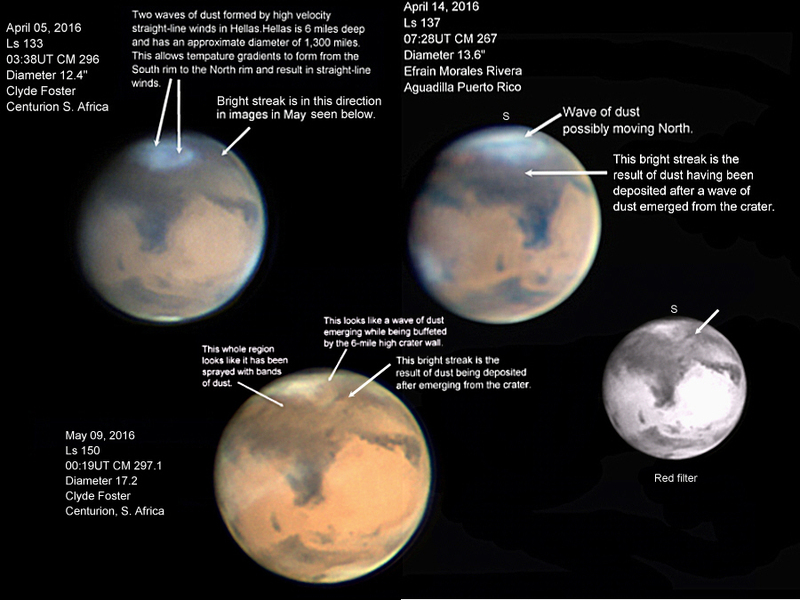 "Images taken by Efrain Morales Rivera (Puerto Rico) in the last few days (May 21-24) clearly show a changeable bright yellow streak of dust at the IAU western (following) edge of Eysium. The bright cloud was very conspicuous in red light and was not related to the usual orographic cloud activity over Elysium Mons. The Director had observed the area on May 16 without seeing the storm, while on May 23 the Elysium region was too near the morning terminator for the correct longitude to have been visible to him. Evidence for previous telescopic dust storms in this area exists, but such events are very uncommon for Elysium, and sometimes the area has simply been a secondary focus of activity for another dust storm developing elsewhere, such as at the start of the 2001 planet-encircling storm. If you are able to do so, please monitor the area and send me your reports. Secondary activity could occur elsewhere at any time now, though an image by Clyde Foster centred at longitude 101 degrees on May 24 shows that hemisphere to be free of dust. Mocht je dus waarnemingen hebben rond deze periode, aarzel dan niet om deze kenbaar te maken door ze te mailen (jerre27-at-gmail.com) of te uploaden op de VVS-website.